End organ failure is the leading health care challenge in the Western World. Nearly 6 million Americans suffer from heart failure with about 550,000 new cases diagnosed annually; 25 million Americans suffer from chronic obstructive pulmonary disease (COPD) with an estimated 12 million new yearly diagnoses; 530,000 Americans suffer from end stage renal disease. Organ transplantation is the only potentially curative therapy available. However, its outcomes are limited by donor organ shortage and the side effects of harsh immunosuppressive treatments. Indeed, there are today 91,000 total patients waiting for a heart, lung, or kidney transplant, with a 2003 median waiting time of 0.6, 2.5, and 3.3 years, respectively. As a result, 5237 Americans died waiting for a suitable donor organ in 2009. Organ engineering is a theoretical alternative to transplantation. Whole organs could be derived from patient’s cells and transplanted similar to donor organs to overcome donor organ shortage, and the need for immunosuppression. Many important milestones have been met towards the goal to build replacement organs. Potential cell candidates have been derived from adult tissue biopsies and differentiated into some of the required cell types such as cardiomyocytes, endothelial cells, pneumocytes, epithelial cells. Culture conditions have been developed to induce the assembly of these cells into functional tissue constructs. However, construction of scaffolds that outline whole organ architecture and enable formation of human size grafts has been a major hurdle. We developed and first reported a novel technique to isolate whole organ extracellular matrix (ECM) scaffolds by a process called perfusion decellularization. In preliminary studies, these ECM scaffolds supported engraftment of specialized cells to form viable and functional hearts, lungs, kidneys, pancreas, and composite tissue that could be transplanted and function in vivo. 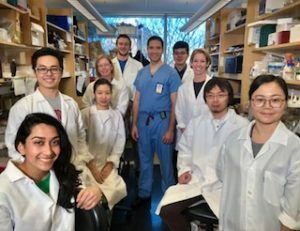 In the laboratory for organ regeneration, we currently further develop perfusion decellularized scaffolds as a platform for organ engineering by developing conditions suitable for human organs, deriving adult cell populations from patients, designing human size bioreactor systems, and developing human organ culture conditions. The laboratory is linked to the Harvard Stem Cell Institute, MIT, Harvard Medical School, the New England Organ Bank, and the clinical departments of MGH. Earlier in 2012, the first clinical trial was initiated, attempting to engineer functional heart tissue for patients waiting for a donor heart. Our research has a high potential clinical impact and may not only change the field of organ engineering, but the treatment of end organ failure. Our projects are highly innovative, and can only be accomplished with the help of a creative and flexible multidisciplinary team.